International Business Machines Corporation (IBM) is now looking for Freshers those who are talented. Also, 2018 and 2019, 2020 passed out candidates are eligible for the IBM Off Campus 2019. Therefore, all the Fresher candidates those who had completed their Any Graduates/ Post Graduates, B.E, B.Tech, MBA, MCA, M.E, M.Tech with good aggregated can start their Online Registration with the help of checking this page. All the Fresher candidates who are in a job search can refer the IBM Off Campus 2019 Drive details and then proceed further steps to attend the ongoing drives which are conducting by International Business Machines Corporation. 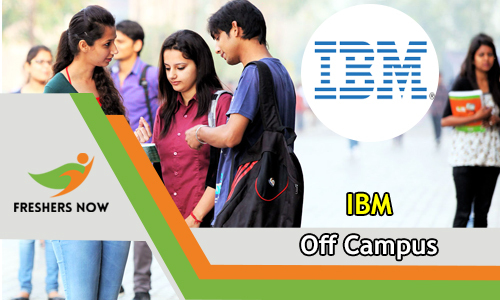 For all the Freshers, this IBM Off Campus 2019 Drive will absolutely help to boost their technical skills. Now, IBM is offering an opportunity for the candidates Across India (Hyderabad, Bangalore, Chennai, Mumbai, Delhi, Pune, Noida, Gurgaon, Kolkata, Ahmedabad). IBM is one of the Americal Multinational Technology company. The IBM Off Campus 2019 is exciting the aspirants. Therefore, follow the below sections and gain more knowledge. All the Freshers can check the mandatory aspects such process to make IBM Off Campus 2019 Drive along with the Documents they all the people need to carry and move at the time of attending the IBM Off Campus Drive 2019. Moreover, we have given a bunch of details in the above sections. Also, we have attached a direct Online Registration link to make your Registration process details. Hence, this article makes your process easier. Take a deep look at the current article and know about the depth information of IBM Off Campus 2019 Drive. Every year the International Business Machines Corporation will conduct the Off Campus drives for all the freshers. After completion of your Online Registration, you have to start your preparation. Because clearing the selection rounds is very touch. Many of the aspirants are looking for IBM Off Campus Drive Registration, IBM Off Campus Drive for 2019 Batch, upcoming IBM Off Campus Drive for Freshers etc. For all your questions, we have given correct answers from this article. Moreover, after completion of your Online Registration Process, take a look at the IBM Syllabus, IBM Placement Papers, and IBM Interview Questions. With the help of the complete material, you can easily know about some technical information. Therefore, just click on the links which we have given in this article. So, apply for the IBM Off-Campus Drives 2019 for positions like Trainee engineer, Entry level Engineer, Network Engineer, and others. Moreover, click on the above link and apply for IBM Off Campus 2019 Drive. With the help of above given direct link, you can easily conclude your registration process. Visit our website Freshers Now on a daily basis and check the much more information about the latest Off Campus Drives for all MNC Companies.